Includes the original 4:3 standard frame size, as well as a newly created WideScreen 16:9 version. Plus a stills gallery of new and old photographs of Truro. 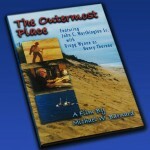 “The Outermost Place” is a tone-poem about a special place – Truro, Mass. This short was made by Michael in 1976- 1980. It is an evocative portrait of Cape Cod fisherman John Worthington Sr. and of the now lost trap-fishing industry that once graced Cape Cod Bay. The film utilizes excerpts from Henry Thoreau’s book “Cape Cod”, as well as Mary Ann Covich-Barnard’s musical evocation of William Blake’s “A Grain of Sand”. Actor Gregg Wynne plays Henry Thoreau. Running time of the film is 13:25.